Your wedding day is meant to be memorable, and the ring you choose should commemorate the commitment you’ve chosen to celebrate with loved ones and friends. If precious metals cost more than you are willing to spend, there is an alternative solution we think you are going to love. Our designer cobalt chrome men’s wedding ring with silver inlay features an exquisite interplay of material and texture. Cobalt is best known for its tantalizingly deep blue color, but, when paired with chrome, this alloy delivers a stunning silver hue similar to that of white gold or platinum. 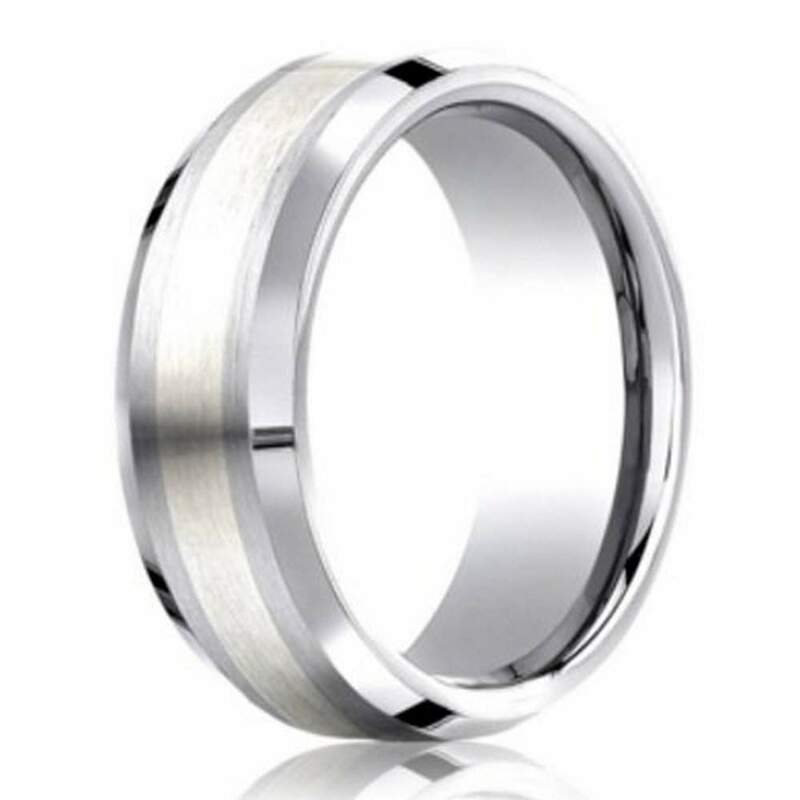 Each 7mm designer cobalt chrome men’s wedding ring with silver inlay features polished beveled edges set against a satin finish that will have you gleaming from ear to ear as you exchange your vows and your rings. JustMensRings.com has helped thousands of couples find affordable wedding rings without any compromise on style and quality. Our designer cobalt chrome men’s wedding ring with silver inlay will look truly sensational on your big day and every day thereafter. Each 7mm designer cobalt chrome men’s wedding ring with silver inlay is designed with a comfort fit band to accommodate larger knuckles. Comfort fit rings traditionally measure a half size smaller than standard bands due to the additional metal used to create a domed interior. We recommend that you visit your local jewelry store to have your ring finger sized for accuracy. If you have any questions, please contact us today.